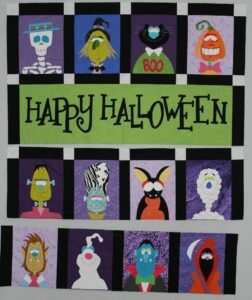 All the details on the appliques along with part of the cornerstones/sashing units were completed on Friday, so Saturday morning started out with Happy Halloween looking like this on my design wall. Once the details were added, Mr Mummy moved to the top of my list of favorites. 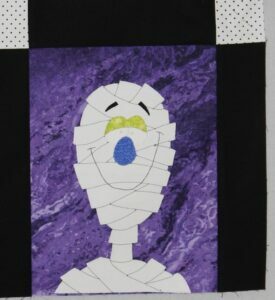 Of course he will look even better once his eyes are sewn on which will happen after the machine quilting. By Sunday afternoon I had a completed quilt top (56 1/2″ x 66 1/2″) – YEAH! I had serious thoughts about replacing the outer border with something brighter and Halloweenish, however I eventually decided to use the fabric provided in the kit. The focus needs to be on the characters in the center of the quilt and I didn’t want anything distracting from that. So the top was finished in time for Halloween – maybe I will have it machine quilted in time for Halloween 2017. After all this applique, I am ready for some machine piecing and a red Lincoln block is next on the list. 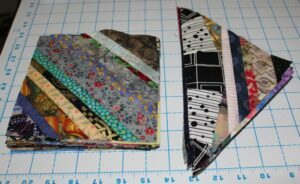 However last week I did manage to finish up all the string blocks needed for another quilt. These strings will be for Bonnie Hunter’s Daylilies except I will use Dresden Plates and a 3 x 3 setting. Right now I making 80 – 4 1/2″ string blocks for Wild Child. I like the idea of having all these parts ready to put together in a quilt. 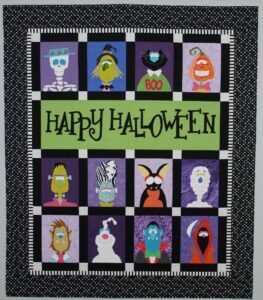 Loving that Halloween quilt! What a cute mummy.